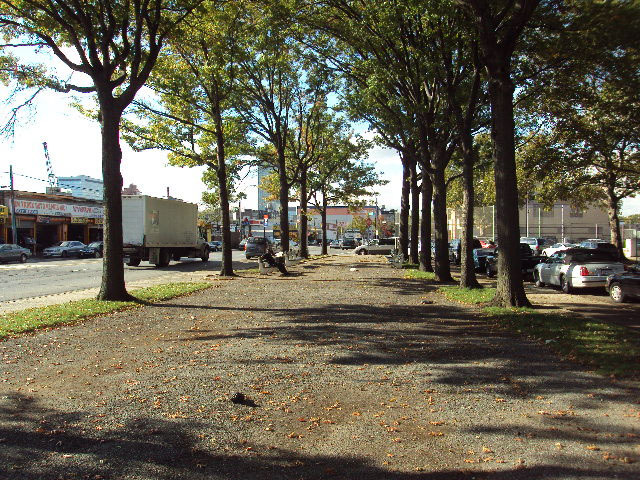 This small sitting park was originally named after Anthony Leo Placella, a native of Long Island City who died in World War I. Placella grew up at 64 Ridge Street, and served in Company F of the 4th Infantry of the United States Army. Placella died of broncho-pneumonia abroad on October 16, 1918, twenty-six days before Armistice and the end of the war. The City acquired the land that is now Sixteen Oaks Park during street acquisition proceedings by condemnation in two parcels on October 10, 1913 and July 28, 1932. On February 16, 1939, the land was conveyed to Parks and, by order of local law, the park was renamed to honor Leo Placella. Parks has since named it Sixteen Oaks Park, because the small traffic median is dominated by sixteen oak trees, and eight sitting benches. Oak is the common name for a variety of hardwood trees that are widespread in the Northern Hemisphere; made up by the genus Quercus, in the family Fagaceae. The oak genus contains about 450 species, but oaks can easily be distinguished from other tree families by their distinctive fruit—the acorn. Flowering occurs in the spring, before the new leaves appear, and large quantities of pollen are shed. Most eastern United States oak trees are deciduous—they lose their leaves in the fall. Oak is a durable, tough wood and an important building material that is used in the making of cabinetry, barrels, flooring, veneers, and corks, among many other things. While oaks are of significant horticultural importance because they are slow growing, they are most often planted in public parks and gardens such as this one. Another important aspect of the oak is its symbolic meaning; standing for strength and long life. Hercules’s club, as legend has it, was fashioned from oak. Like all trees in myth, oak represents the world, a bearer of life and a sturdy foundation from which to grow on. The oak tree is also an unofficial emblem of England, and has been adopted as the national tree of the Irish Republic. Bounded by 37th Avenue between 14th and 21st Streets, this park stands across the street from Jacob Blackwell Public School 111, in Long Island City, Queens. Long Island City, which includes the neighborhoods of Astoria, Hunter’s Point, Steinway, Blissville, Dutch Kills, Bowery Bay and Ravenswood, take its name from a newspaper that had started operation there in 1865, the Long Island City Star.